1. Whether paying by cheque, card or cash, start your order above. Ordering there enables us to log your order details more efficiently. It also provides both parties with a unique order number so we can keep a track of your order, process it as quickly as possible and notify you when your blades have been sharpened and dispatched. 2. Prices include postage in both directions. You can print and use our freepost address label for free inward postage. 3. Follow the instructions on the postage label. Enclose the correct slips inside your package along with your blades, scissors or clipper. The order number is the number generated once payment has been made, straight away on our website and also in an email confirmation. If paying by cheque, please enclose the cheque. Please write your name, the first line of your address and postcode on the back of the cheque. a. Please do not send clipper blades for sharpening in tins or boxes. Doing so has a drastic effect on the cost of postage to and from Shear Ease. Packaging blades as flat as possible helps us keep our costs low and it dramatically reduces the risk of breakages while they’re in the postal system. As standard Shear Ease will not return boxes or tins. They can be returned for a charge of £4. b. Secure blades onto a piece of stiff cardboard, an old cereal box is ideal. c. Make sure the cardboard fits snug into a padded envelope. d. Secure the address section to the front of your envelope. Our Freepost label ensures you will not need to pay any postage. It is meant for sending us clipper blades or scissors, please do not use it for clipper. It does not include insurance or tracking. If you need either of these they can be arranged at your local post office. Thanks for the feed back Kim! Super fast turn aro7nd was back within a couple of days. Very easy to use and the recycled envelope system is fab. Thanks for the 5 star rating Tracy! Hi Anita, Many thanks for you feed back! First time I have used sheareaseltd and found it to be easy, quick and efficient. Recommended by a friend, very quick service, told me which blades were no longer viable and came back in a neat plastic tray with info Wrapped around each blade. Will be using there service again. Thanks Claire, appreciate the review! Excellent service and such a quick turnaround! I’ve used Shearease for blade sharpening for a number of years and have never been disappointed. The speed of the service is second to non and the rotation of prepost envelopes make organising sending blades off a stress free and effortless task. Would highly recommend this service. Thanks for your comments, look forward to working with you again! Blades were returned very quickly and will definitely use again. I am always impressed with the service from Shearease. I posted 2 sets of blades on Saturday and they were back sharp and clean on Tuesday morning. I have always had excellent service from Shearease and have been using them for years. Thanks Sally we turn our blades within the day and glad to hear you continue to use us! Have been using Shesrease for almost 20 years. Excellent service and turnaround times. Wouldn’t use anyone else. Hi Lynn thanks for your comments and your long standing custom for the past 20 years!! I have used this company for quite some years now. They offer a no quibble, quick efficient service. I regularly post for e.g. on a Wednesday and have my blades back by the Friday. Highly recommended! Hi Holly, many thanks for your feedback! Thanks again for your custom Lou. Thanks Sandra, once we receive the blades we make sure they are sharpened on the day and sent out to our customers! Many thanks for your comment Sandra. Very speedy turn round – so helpful! Have not yet used this set of blades, but I expect to be impressed! Hopefully you were impressed with our sharpening Hala! Hope you’re impressed Hala. Thanks again for the feedback for the comments! Very pleased with the service and turnaround times for clipper blade sharpening. Glad to hear your please with our service Krissi! Glad you found it straightforward and appreciate the feed back Alison. This is the first time I have used this service and will use them again from now on. Process is made simple with ordering/postage option, very speedy, efficient service – blades sharpened and returned within two days. Would definitely recommend! Thanks. Many thanks for the recommendation Karen, if we can be of help, please feel free to contact us anytime. Blades sharpened on the day they received them and back the following morning. Can’t ask for better service, highly recommended. Thanks for the recommendation Emma! Very fast service, have used this company for some time and always have excellent service and very sharp blades. Thank you for your on going custom Beverley! Thank you for your comments Emma. Excellent service. Turnaround was very fast. Not used the blades yet but they do feel very sharp to the touch. Came back very well packaged to. Thanks. Thanks for the comments, the packaging can also be reused to send blades back to us! As always an excellent service from start to finish. Hi Diane, many thanks for your kind feed back! Thanks for the comments Tony! Thanks for your custom Jo! Thanks! We strive to give our customers a quality service, appreciate your comments! Many thanks for your comments, hope to work with you again! Blades posted and returned within 3 days! Can’t beat that for service. Definitely recommended. Thank you. Thanks Sophia, see you again soon! Really efficient service. I really can’t fault the quality. Thank you! Brilliant service as always from Shear Ease. Easy payment system and blades return extremely quickly all in working order! Thanks for the feed back Julie! Your welcome Jo. Thanks again! Excellent service. Sent one day and back next day. Free postage and very good price. Was left stunned at how efficient & professional ShearEase sharpening service is! From placing order, freepost and the one day turn around. Returned to me in a reusable envelope, each blade individual wrapped and in secure packaging. Fantastic service & will without a doubt use them for all my clipper needs. Thanks. Really appreciate your kind comments. We do work hard at making it as efficient as possible! Fast service clipper blades like new, the best company I have ever used to sharpen blades, thank you. 🙂 thank you again Nicky! Hi Tabitha, really value your custom and feed back. Thanks! Thanks for your kind comments Michaela! Look forward to working with you again in the near future! 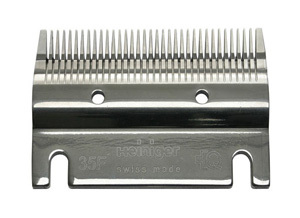 i have used shearease to sharpen my clipper blades for several years now. The freepost returnable envelope makes the whole process quick and easy. Thanks for the comments Sarah, we do value your custom. Thanks Lynne, good to get your feed back on our service! Super quick very easy to use service. Postage included so no need to pay extra or go to the post office. Have used Shear Ease for years and would never go anywhere else. Fantastic thank you. Brilliant feed back, thanks for review Katie! Thanks for your feed back. Look forward to working with you again in the near future! Brilliant, quick service. Highly recommended. Great service, fast turnaround, blades really sharp. Thanks for your comments Heather, much appreciated! Two sets of Horse clipper blades returned within the week. I have not used them yet , but judging by the quality of sharpening of a friends blades( who put me on to SHEAREASE ) i can foresee no problems. Excellent service. Thank you so much SHEAREASE. Mr. C.Hawkes Alfriston,East Sussex. Thank you Mr Hawkes, hope the blades were up to your expectations! Thanks for your kind comments, hope to work with you again in the near future! 1st class service, really quick return and very handy with the packaging ready to use next time. Easy to pay online and then pop them in the post. We try and make our service as efficient as possible. Thank you for your feed back! Thanks for your feed back Lyn! Amazingly quick turnaround. The packing and postal system operated is excellent, couldn`t be easier. Many thanks Kotti. Look forward to working with you again in the near future! Thanks Vicky, look forward to working with you again! Very quick turnaround and decent pricing for multiple blades. Appreciate your feed back Laura! Quick turnaround – feels like they are back before they have gone! Excellent for unorganised people like myself. Fast and quality service from a local business, thank you. Thanks for the generous review, we work hard at giving the best service! Many thanks for the 5 star rating Valley Hill! Thanks for the recommendation Shane! Having used a number of local & postal blade sharpening services, I have found Shearease the best by far. Fastest turnaround times with convenient post & packaging supplied. Couldn’t be quicker or easier! Thanks for your detailed review Andrea, very much appreciated!Shearease. Many thanks for your custom and review Rosie! Can’t believe how quick the turn around time was to getting my nice sharp clipper blades back. Fantastic service. We are very happy to hear this Jess! Thank you! Fast turnaround. Will definitely use again. Thanks for your review. Look forward working with you in the near future! Sent on Saturday, received on Tuesday in custom packaging and oiled ready for use. Very quick service and I will certainly use again. Cannot find fault. Glad you found no faults 🙂 thanks for the kind review Ian! Very happy with the service, not tried the blades yet, but used before and always been happy.. Very quick.. Outstanding service – will definitely use again. Many thanks for the rating. Look forward to working with you again in the near future! Hi Cathy, thanks for your detail feed back and comments. Makes us happy to hear that the experience was positive! I had 7 (yes, really, that many) blades to get sharpened. The local saddlers advertise a local man who comes by every so often. Blades are away with him for a week. Plus you’ve got to drive to the shop beforehand, and again to pick them up, all of which results in a two week turnaround. With Shearease the blades are back within a few days, and you only have to visit one post box to send them. Which is FREEPOST. I like the sealed plastic trays the blades are returned in, keeps them safe and secure until needed. Only downside was the oil on the outside of the plastic trays which got onto other things. Thank you for your kind comments and your on going service! Many thanks for your review Sarah, glad you approve! Excellent service – have recommended to all my friends. Thanks for the recommending us to your friends, we do appreciate it! Can’t fault this company or the quality of the workmanship, the whole process is simple, efficient and quick. Thanks for the kind comments we do appreciate your feed back! I am amazed at the service given, clipper blades sharpened and sent back by return of post, reasonably priced too, with postal charges included. So simple to use service and such a time saver. Really recommend them. FANTASTIC QUICK AND EASY SERVICE. Thank you for taking the time to review our service! Excellent service with prompt delivery, will highly recommend. The service is brilliant, very fast turn around and easy to use, however never yet have I managed to get the credit card option for payment to work. Every time I’ve tried with different cards it rejects saying the address isn’t valid! I have to send cheques instead. I have written to Shear Ease in the past about this but received no reply. Hi Miranda, i’m sorry to hear about your frustration with the online payment. I will contact you to run through this and see what the issue is. Thank you for your feedback, Shearease. Quick, super easy service so pleased. Amazing, easy and super quick come back sharper than ever really impressed and great being able to get discount on the more I send really pleased! Will definitely only be using shearease for all my clipper needs from now on! Glad you enjoy our service, hopefully work with you again in the future! Absolutely amazing service! Free postage, professionally packaged, great price AND unbelievably quick turnaround! My horse only looked like a half clipped blonker for a matter of days! Completely supersceded expectations. Will use and recommend again and again and again! The service is top class. Detailed instructions online on how to pack and post clipper blades and turnaround in a day. This was a fast efficient process returning my blades in just two days. Excellent value for money. Many thanks for the comments Janet! Excellent, quick service. Have used your company for years and will continue to do so. Thanks for your custom Susan! Fabulous service. Super fast turnaround, and easy to pay on-line. Wouldn’t go anywhere else. My blades look new! Excellent and easy service. Completely hassle free! Thanks Lydia, glad your happy with the end result! Great service as always. Quick return of blades and lovely and sharp. Many thanks for the feed back Sheel! Thanks for the recommendation Lynne! Love shearease I have used a few times now and am always happy. Blades come back the next day postage is all Inc such an easy company to shop with. I will always use them. Highly recommended. Thanks you so much for your generous review, we very much appreciate it! Thanks for the kind feed back Tori, look forward to working with you in future! Such a good and fast service. I don’t go anywhere else. Thank you again. Hi Caroline, many thanks for your review. Much appreciated! Fantastic service!!! Very quick turnaround, with packaging I can use next time!! Perfect. Definitely use again. Thanks for your review Glennis and kind feed back! Super-efficient easy service to use. Can highly recommend. Thanks for the feed back and recommendation Jo. Many thanks for the 5 star rating and recommendation! Many thanks for your kind feed back Robin! Hi Julie, appreciate the 5 stars and feed back! Many thanks for your generous comments Helena! The blades were returned as advertised. Easy website. Thanks for the great feedback David! First time using your sevice, from start to finish the value for money is amazing and now my blades are all greased and oiled and in a cute little box perfect for storing until i need them, have blown your trumpet all over facebook, I hope you get loads more business! Thanks Karen, we are always striving to make things easier and simpler and although not always possible, quicker too. Thanks joy, we do try! Thanks Caroline, we are back to our same day turnaround now. Hi Rachael, thanks for the kind words. Hopefully you will use us again, thanks Karen! Hi Collette. We managed to maintain single working day turnaround all year this year. Glad it’s appreciated! Thanks Ethan, your recommendations are much valued. Couldn’t have been any quicker! Very impressed with the overall service – I sent my friend’s blades with mine and she couldn’t believe the turnaround. Highly recommended. Fast and efficient service. Very happy. Will recommend. Thanks for the recommendations Victoria, much appreciated! Sent 5 sets of horse clipper blades on Monday – got them back Wednesday- super sharp! Very efficient – will use again and thoroughly recommend ShearEase! Thanks Lucy, we really appreciate your custom. happy clipping! I have used Shear Ease for over 15 years to sharpen my horse clipper blades. The super fast return system has never let me down. I cannot recommend this company highly enough. Thank you very much Nicola. Please know we appreciate your continued custom. High praise Amanda, high praise! Thankyou. Very impressed with the service, fast and you even get another prepaid envelope, thank you! Hopefully you’ll make good use of the envelope! Hope you use us again, thanks for the kind words. Please do recommend us… much appreciated! Absolutely fantastic service again. Thank you ?? First time using your company and WOW I am so pleased with the speed you sharpened my blades and the quality of the sharpening. Thankyou so much. I will definately be recommending you to everyone at my yard. ☺? Thanks Elaine, much appreciated! We look forward to serving you in the future, thanks for the recommendations! I have used ShearEase for years. Always been a superb service. This time my 3 blades didn’t arrive at their office. Rachel was fantastic…. she contacted their sorting office until she found them and kept in touch throughout Exemplary customer service. THANK YOU. Thanks, your comments have been passed on to Rachel. Thanks for the kind words. Thanks Andrea, you continued custom is much appreciated! Excellent service, blades were back super quick. Thanks Julie, glad you got your blades back in a timely fashion! Really fast service, loved the reusable packaging. Will definitely be a regular customer. That’s great… a keeper! Thanks for the kind words. I have used Shear Ease before, they explain what you need to do and the blades are returned very quickly! Thanks Claire, we do our best! Hopefully we can serve you again in the future. Could not be easier – took far less time than taking them to my local saddlery and cost a lot less as well. Posted Saturday (after the box had been emptied) and they were back on Wednesday. Thanks Helen, please know we appreciate your custom! Thanks allot Barbara, kind words always appreciated! Sent blades off for sharpening Monday lunchtime and they were back with me by Wednesday morning. Fantastic service. Thanks Alex, glad we got you sorted in a timely manner! Happy clipping! I wish everyone I ordered from was as efficient as these guys. The clipper blades came back so quickly my husband jokingly asked if the postman had done them. Cannot fault them, highly recommended. Thanks Jenny! We’ve heard a few things that have made us chuckle but that’s the best! Thanks Sarah, please remember us for next time! I’ve used ShearEase for many years and the service is always consistently fast and efficient. I’ve never had any cause for complaint and would highly recommended. We certainly appreciate your custom Linda, thanks allot for the kind words as well! First time I have used this service. Very efficient. Thank you.